The LVX Winter Resort Collection is an amazing mix of vibrant, rich colors and until Valentine's Day you can get 25 percent off your order. The promotional code is below. LVX: Latin: lūx Translation: Light; the essence of all color. "LVX recognizes the value of beauty in Fashion. LVX is a deeply devoted fashion brand, dedicated to providing an in depth understanding of high fashion trends and indulgence in luxury living. Our unique color collections are meticulously selected to be the top colors of the season, and will be the perfect complement to your wardrobe. LVX is committed to creating palettes that exceed seasonal trends while maintaining a timeless essence," - LVX Website. The Winter Resort Collection has something for everyone - stunning creams and fabulous shimmer/metallics. They have a wonderful formula with an amazing application and a fast dry time. They dry to a high gloss shine. Alchemy - is a shimmery. metallic, rich gold polish. Two coats provided fabulous coverage. This provides a lot of glitz and glam. Tribute - is a a vivid, deep, shimmery blue. I am partial to blue and this polish is a good example of why. It has a depth to it that seems to go on forever. This is two coats. Aubergine - is a wonderful muted shade of purple/plum. Soft enough for Spring but deep enough for Winter. This is two coats. Creamfields - is a pure, soft-white sheer cream. I like my manis to be opaque so I did use three coats of this polish. But what an amazing soft shade. Dark Matter - is a rich slate gray shade. A high gloss finish and a rich color make this polish a must have for your collection. Luxe - is a shimmery, metallic silver that is classy and rich. Soft and shimmery yet somehow vivacious and bold. 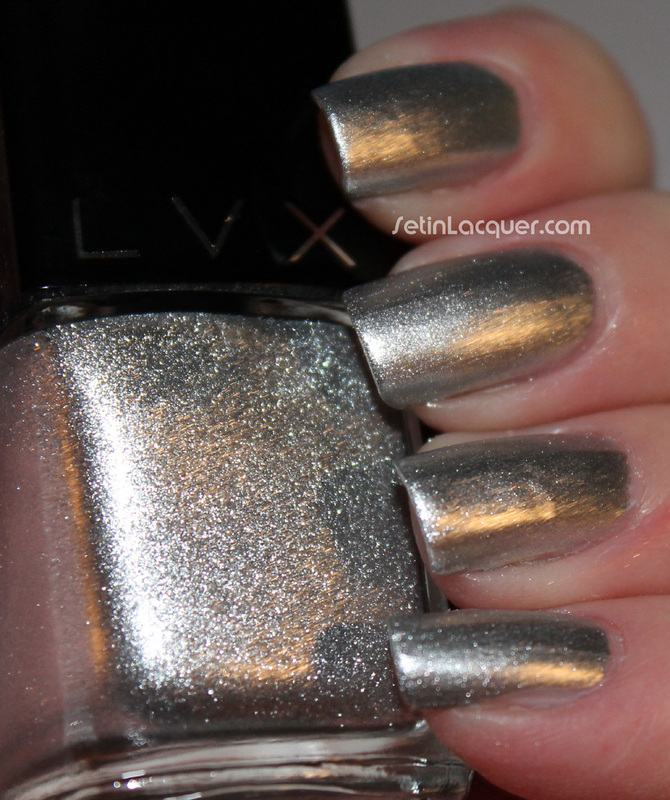 LVX is a brand I hadn't used before. But you can be sure I will be adding them to my shopping stalking list. These polishes are amazing. You can get this collection and more on their website at www.shoplvx.com for $16. But I have a code for you to use to get 25 percent off your order between now and Valentine's Day. Use the promo code V25. Make sure you are getting information on their new collections by following them on Facebook. LVX is five-free. Its long lasting, chip resistant and non-streak formula is free of toxic and harsh chemicals. LVX products are formulated without the use of Formaldehyde, Formaldehyde Resin, DBP, Toluene, and Camphor.